Last April I picked up a pack of free watermelon seeds at a festival. I planted them. They didn't come up. For months. 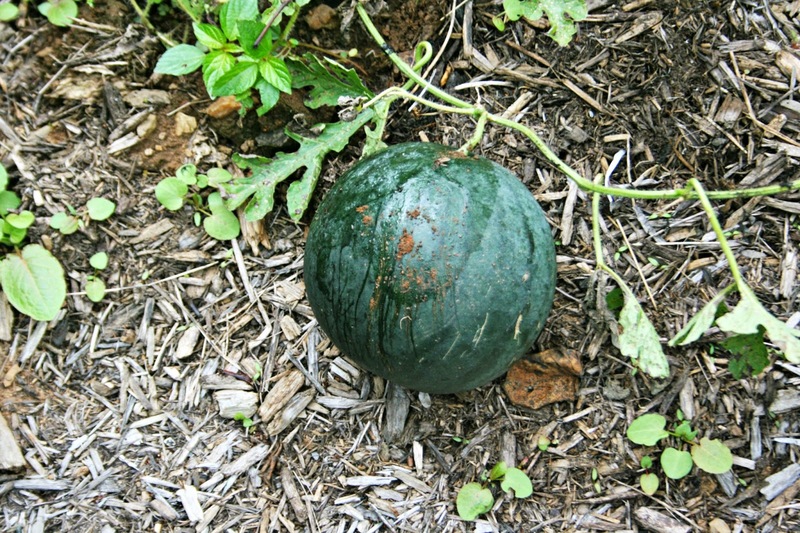 Then in August I noticed a little watermelon vine. It sprouted a tiny fruit. I didn't think it had time to do much. It got a little bigger. But was still small. And then one day stopped growing. Once it stopped growing over a few weeks, I figured I'd better pick it. Overnight frosts were looming closer. Well, guess what? It was ripe! It had a lot of seeds I had to pick out, but was sweet and tasty. The boys just loved it! It was a happy garden surprise. I have plenty of lettuce, carrots, and kale growing, which I hope will last a while longer. Readers, do you grow any fall crops? I am going to try some next year, I haven't had them produce anything in the past. You got a nice surprise with that one. I don't usually plant anything for fall. I'm surprised about the watermelon..but the weather has been so strange. My roses are blooming and my hydrangea has decided to come to life...very weird. 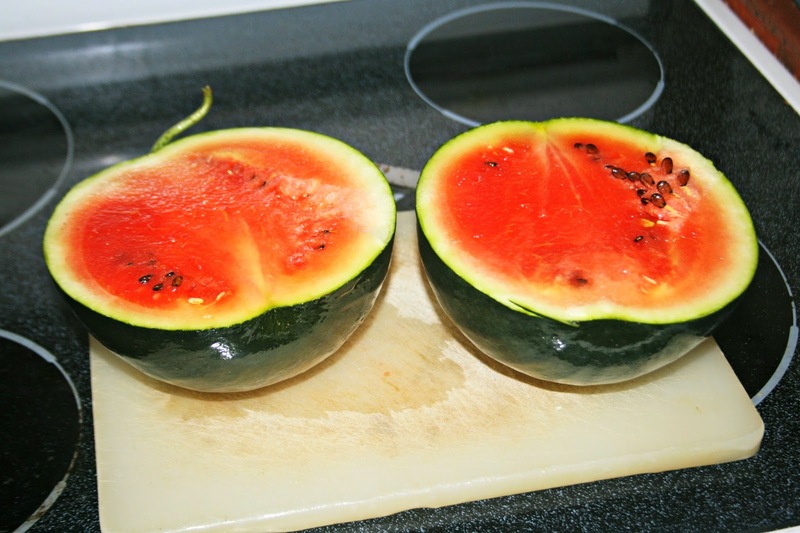 Yummers, I haven't eaten enough melon this year. really cute! and glad it tasted good! We tried to grow strawberries, and only got a few. At least the watermelon was tasty. That was a neat surprise! Wonder if it was a small-size variety? We didn't plant fall crops. But we got cucumbers well into September, which surprised me. I thought my tomatoes were finished and found a random vine sprouting some new toms. A nice surprise. Looks like that pumpkin was a nice surprise too! What a col surprise! So it was this green color? Here, there are lots and lots of different colors now. So does the color make the taste different? I love surprises like that! It looks so very tasty, and yummy. I don't have much luck with crops. I got a few squash but the other stuff I planted barely grew. Wow... it must be so fresh, sweet and tasty. I always fail on growing watermelon. How lucky you are. what an unusual shape for a Watermelon, I'm used to the elongated ones. It is a lovely colour and looks delicious and really only one fruit from many seeds-isn't it odd how this happens sometimes. I don't - but the watermelon you have looked really good - hope it was. That is the best kind of surprise. Lucky you to still have things growing in your garden. Enjoy! Not this year but I've grown watermelons for a lot of years we've lived here. People told me it couldn't be done but with some black plastic to help heat up the plants, I've always had a bumper crop. So glad your melon didn't disappoint; glad the children were delighted...that's the main thing. What a sweet treat. I bet the boys love that. It looks delicious! I am so glad you were able to eat it. What an awesome surprise!! What a special garden gem this year. That watermelon looks perfect! At least you got one! Did you save any seeds? And last year, brussels sprouts.